Whether inspired by classic baroque or modern minimalist lines and shapes, Danhov's award-winning avant-garde designs are statements of the wearer's discerning taste. Danhov’s unparalleled skills for crafting well-designed engagement rings with intimate precision and care is absolutely unmatched. From their unique hand-crafted swirl engagement rings to their very cool, sleek, chic, and polished contemporary engagement rings, Danhov’s infinite selection incorporates a variety of styles and tastes into manufacturing select pieces. These avant-garde engagement rings are complete statements that sell themselves with their gorgeous tendencies and outstanding effervescent shine. Jack Hovsepian, the founder of Danhov, became a special jewelry connoisseur for the technique of marrying proper precision with art. Established in 1984, the Danhov philosophy of creating luxurious and exquisite pieces by detailed handiwork became a forte that developed into a thorough business mindset. Inspired by his own fashion designer of a father, many of the contemporary engagement rings are unconventional and trendsetting. Due to the constructing of traditional manufacturing processes utilized, the complete process of creating Danhov engagement rings is responsibly eco-friendly. 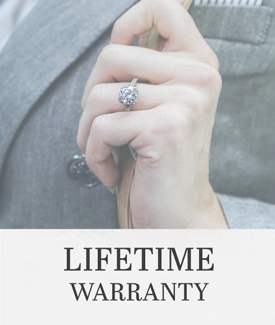 The hand-assembled custom pieces by Danhov come well-equipped with a lifetime manufacturer’s warranty to guarantee their untarnished and absolutely flawless life-long permanence. All these assets attribute to the experience that is The Danhov Difference. The exquisiteness of Danhov is the full wide variety of rings readily available for purchase at Icing On The Ring. These modern engagement rings incorporate a flat-edged finish on their band for a chic look, while the graceful swirl motif engagement rings are assembled by hand with one singular wire for a vintage and authentic feel. The jewelry artisans at Danhov are the originators of the single-wire technique for engagement rings that include a swirl motif as a basket. Danhov’s ornate techniques of methodically fashioning each engagement ring are ultimately specialized and custom-built for your matrimonial preference.